Oxidative stress is the major etiopathological factor in adriamycin-induced cardiotoxicity. Relatively low amounts of endogenous antioxidant makes the heart vulnerable to oxidative stress-induced damage. Chronic oral administration of garlic has been reported to enhance the endogenous antioxidants of heart. We hypothesized that garlic-induced enhanced cardiac antioxidants may offer protection against acute adriamycin-induced cardiotoxicity. Rats were either administered freshly prepared garlic homogenate (250 and 500 mg/kg daily, orally, for 30 days) or probucol (cumulative dose, 120 mg/kg body weight divided in 12, i.p. over a period of 30 days) or double distilled water (vehicle), followed by a single dose of adriamycin (30 mg/kg i.p.). In the adriamycin group, increased oxidative stress was evidenced by a significant increase in myocardial TBARS (thiobarbituric acid reactive substances) and decrease in myocardial SOD (superoxide dismutase), catalase and GPx (glutathione peroxidase) activity. Histopathological studies showed focal as well as subendocardial myocytolysis with infiltration of macrophages, lymphocytes and edema. Immunocytochemistry showed marked expression of TNF-α (tumor necrosis factor-alpha) in the myocardium. Increase in myocardial TBARS and decrease in endogenous antioxidants by adriamycin was prevented significantly in the garlic treated rat hearts, which was comparable to the probucol-treated group. Histopathological evidence of protection was also evident in both garlic-treated and probucol-treated groups. 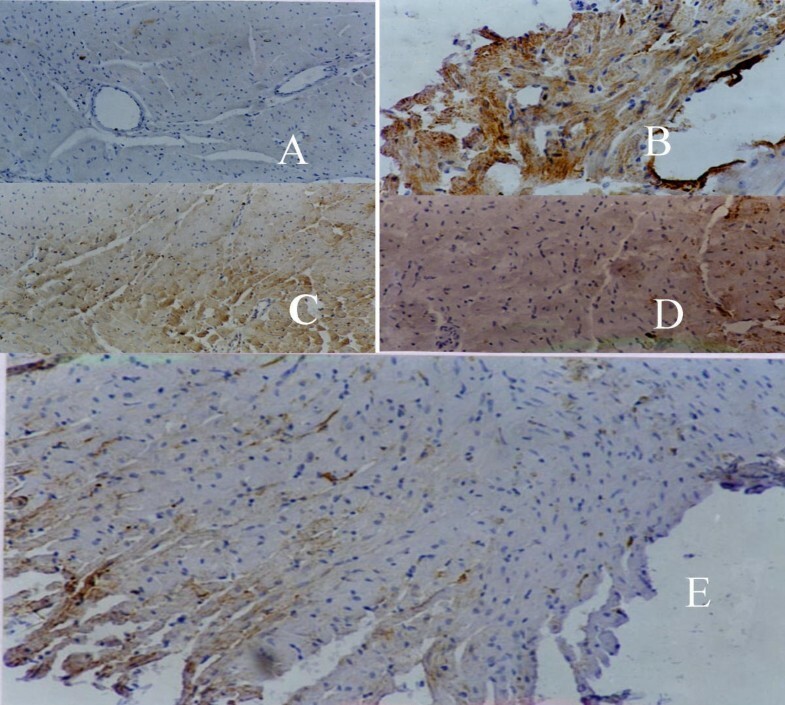 Probucol, 250 mg/kg and 500 mg/kg of garlic reduced adriamycin induced TNF-α expression in the myocardium and was associated with reduced myocyte injury. It is concluded that chronic garlic administration prevents acute adriamycin-induced cardiotoxicity and decreases myocardial TNF-α expression. Adriamycin, an anthracycline antibiotic, is widely used in the treatment of a variety of human malignancies, including breast cancer, small cell carcinoma of the lung and acute leukemia's . Like most of the anticancer drugs, adriamycin also causes various toxic effects, the commonest of which is the dose-dependent cardiotoxicity which leads to acute and chronic heart failure . Cellular damage induced by adriamycin is mediated by the formation of an iron-anthracycline complex that generates free radicals, which, in turn, causes severe damage to the plasma membrane and interferes with the cytoskeletal structure . Due to the presence of a less developed antioxidant defense mechanism, heart is particularly vulnerable to injury by anthracycline-induced reactive oxygen species . Considerable efforts have been made on using antioxidants and iron-chelators to protect the heart against adriamycin toxicity. Initial attempts to use traditional antioxidants, like N-acetylcystiene , tocopherol  in the prevention of adriamycin-induced cardiotoxicity were not very successful. Dexrazoxane, the only drug presently approved by FDA to prevent adriamycin-induced cardiotoxicity, is an iron chelator and possesses potent antioxidant properties. But, due to the high incidence of dexrazoxane-induced myelosuppression, its use has also been limited to some advanced stages of malignant disorders . Therapeutic strategies, designed to augment cellular endogenous defense systems have been identified as a promising approach to combat oxidative stress-associated disease conditions [8, 9]. In this respect, probucol, a lipid-lowering agent, which augments endogenous antioxidants, has been shown to offer protection  in preventing adriamycin induced cardiotoxicity. Garlic, well known for its medicinal use since ancient times, has been reported to have antioxidant properties in vitro . Recently, it has been shown that chronic intake of garlic enhanced SOD and catalase in rat heart and shown protection against oxidative stress induced by ischemic reperfusion injury [12, 13]. Oxidative stress-induced cardiotoxicity is mostly mediated through expression of different cytokines, especially TNF-α [14, 15]. TNF-α has been implicated in the pathogenesis of heart failure of varied etiology . Modulation of TNF-α expression constitutes an attractive therapeutic option in such conditions. Substances, which can inhibit TNF-α expression in oxidative stress-induced cardiotoxicity, have potential therapeutic value. In view of these facts the present study was designed to test the hypothesis whether a nutritional strategy like chronic garlic administration could prevent adriamycin-induced acute cardiotoxicity, in terms of oxidative stress, expression of myocardial TNF-α and tissue injury. There was significant (p < 0.01) increase in myocardial TBARS in the ADR group (328.72 ± 34.76 nmol/gm wt) when compared to the control (CTR) group (203.03 ± 11.52 nmol/gm wt). Significant decrease in the level of myocardial TBARS was observed in PRO+ADR (p < 0.001), G-250+ADR (p < 0.001) and G-500+ADR (p < 0.02) groups (145.16 ± 13.13; 103.40 ± 17.24 & 276.54 ± 19.60 nmol/gm wt respectively) in comparison to the ADR group. Significant (p < 0.001) increase in myocardial GSH was observed in the ADR group (688.02 ± 12.17 μg/gm wt.) in comparison to the control (CTR) group (479.17 ± 40.76 μg/gm wt.). In the groups PRO+ADR (p < 0.001), G-250+ADR (p < 0.001) and G-500+ADR (p < 0.01), there were significant decrease of myocardial GSH (507.46 ± 17.40; 447.59 ± 18.55 & 629.52 ± 11.37 μg/gm wt. respectively) when compared to ADR group. In the ADR group (13.81 ± 3.70 U/mg protein) there was a significant (p < 0.001) decrease in myocardial catalase compared to control (CTR) group (49.49 ± 2.91 U/mg protein). In the group PRO+ADR (14.76 ± 1.99 U/mg protein), there was no significant increase in the level of myocardial catalase compared to ADR group. However, significant (p < 0.001) increase in myocardial catalase level was seen only in group G-250+ADR (25.12 ± 3.33 U/mg protein) but not in group G-500+ADR (15.41 ± 3.21 U/mg protein). In ADR group (4.54 ± 0.53 U/mg protein), there was a significant (p < 0.05) reduction of myocardial SOD level when compared to control (CTR) group (6.88 ± 0.79 U/mg protein). There were no increase in the level of myocardial SOD in PRO+ADR and G-250+ADR groups (6.21 ± 0.79 & 6.08 ± 1.72 U/mg protein respectively) when compared to ADR group. But significant (p < 0.02) increase in SOD was observed in G-500+ADR group (7.61 ± 0.93 U/mg protein). Significant (p < 0.05) reduction of GPx activity was observed in ADR group (0.083 ± 0.002 U/mg protein) when compared to control (CTR) group (0.193 ± 0.04 U/mg protein). Increased of the GPx activity were observed in all three groups, PRO+ADR (p < 0.05), G-250+ADR (p < 0.05) and G-500+ADR (p < 0.001) (0.158 ± 0.03; 0.149 ± 0.03 & 0.177 ± 0.01 U/mg protein respectively). There was a significant (p < 0.05) decrease in the heart weight: body weight ratio in the group ADR (5.78 ± 0.20, 1 × 10-3) compared to group CTR (6.25 ± 0.18, 1 × 10-3). There was no significant fall in the heart weight: body weight ratio in PRO+ADR, G-250+ADR and G-500+ADR groups (6.15 ± 0.17; 6.13 ± 0.12 & 6.29 ± 0.13, 1 × 10-3) compared to group ADR. Marked tissue injury with subendocardial loss of muscles and accumulation of acute inflammatory cells surrounded by mild edema was seen in ADR group (Fig. 1A). In the PRO+ADR group (Fig. 1B), only focal necrosis of muscle fiber with moderate edema was noted. Multiple necrotic foci with marked edema was seen in group G-250+ADR (Fig. 1C), which was less in G-500+ADR group (Fig. 1D). 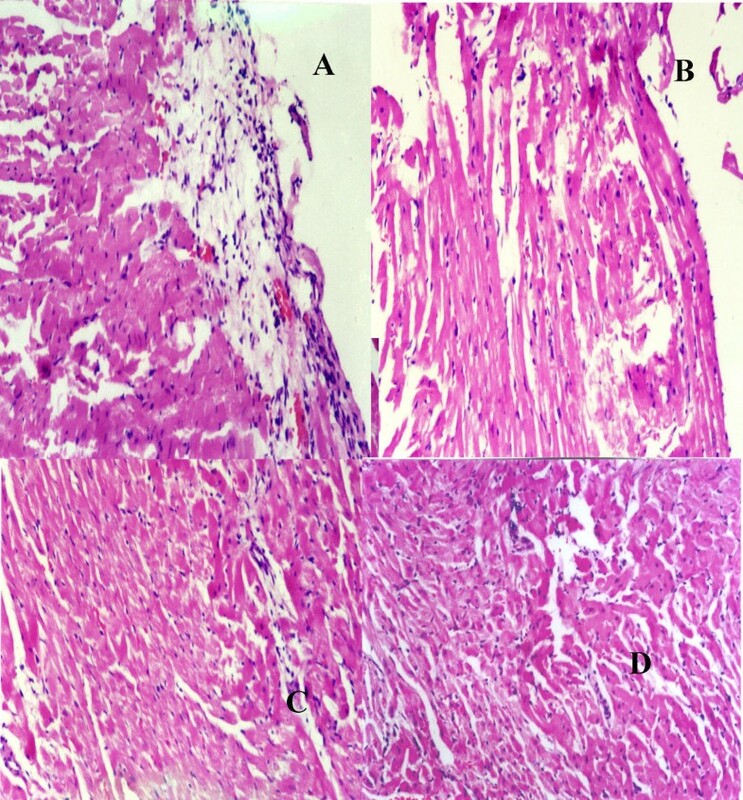 Light micrograph of rat heart A] treated with adriamycin (ADR) showing subendocardial loss of muscles with inflammatory cells surrounded by edema (H&E × 10) B] treated with probucol and adriamycin (PRO+ADR) showing focal necrosis of muscle fibre with mild edema (H&E, × 10) C] treated with garlic 250 mg/kg and adriamycin (G-250+ADR) showing multiple focci necrosis of cardiac muscle with marked edema (H&E, × 10) D] treated with garlic 500 mg/kg and adriamycin (G-500+ADR) showing no significant muscle necrosis with mild edema (H&E, × 10). Heart section from a rat A] treated with normal saline (CTR) showing no expression of TNF-α in the myocardium (H&E, × 10) B] treated with adriamycin (ADR) showing marked expression of TNF-α in the myocardium, blood vessels and the subendocardial region (H&E, × 25) C] treated with garlic 250 mg/kg and adriamycin (G-250+ADR) showing occasional myocardial and blood vessels expression of TNF-α (H&E, × 10) D] treated with garlic 500 mg/kg and adriamycin (G-500+ADR) showing only subendocardial TNF-α expression (H&E, × 25) E] treated with probucol and adriamycin (PRO+ADR) showing occasional TNF-α expression in the blood vessels as well as in the endocardium (H&E, × 10). There was no expression of TNF-α in any region of the untreated control (CTR) rat hearts (score: 0, Fig. 2A)). Intense (score: 4, Fig. 2B) TNF-α expression was seen in the subendocardial region, myocardium and the blood vessels in the adriamycin treated rat hearts (ADR group). Probucol treatment (group PRO+ADR) caused a reduction of TNF-α expression (score: 1.6, Fig. 2E) in the myocardium, endothelial region and blood vessels. Similarly, in G-250+ADR and G-500+ADR groups, there was less expression (score: 2.8, Fig. 2C and 2.9, Fig. 2D) of TNF-α in the myocardium, blood vessels and subendocardial region compared to ADR group. However, in the group G-500+ADR, there was least TNF-α expression in the myocardium. Adriamycin is converted into its semiquinone form in the cardiac myocyte by myocardial CYP450 and flavin monoxygenases. The semiquinone form is a toxic, short-lived metabolite and interacts with molecular oxygen and initiates a cascade of reaction, producing reactive oxygen species (ROS) . Another reported mechanism of adriamycin-induced oxidative stress is the formation of an anthracycline-iron (Fe2+) free radical complex . The latter reacts with hydrogen peroxide to produce hydroxyl (OH•) radical. ROS react with lipids, protein and other cellular constituents to cause damage to mitochondria and cell membranes of the heart muscle cells. In the present study, a single dose (30 mg/kg) of adriamycin caused a significant increase in myocardial TBARS and decrease in myocardial SOD, catalase and GPx activity indicating an increase in oxidative stress. The increase in myocardial GSH appears to be paradoxical, the mechanism of which although not clear may be postulated. Due to reduced GPx activity myocardial GSH can not be adequately oxidized to GSSG, as part of its antioxidant activity. As a result of which the level of GSH rises due to "trapping" of glutathione in its reduced form. Adriamycin also caused a significant decrease in heart weight / body weight ratio, which indicate loss of myofibrils and cytoplasmic vacuolisation in myocytes . Histopathological studies revealed loss of myofibrils, subendocardial myocytolysis and vacuolization in the adriamycin treated rat hearts. Similar observations have also been made in earlier studies on acute adriamycin-induced cardiotoxicity [27, 28]. Increase in SOD and catalase activities in rat heart following chronic garlic intake, as reported earlier by our group , has a special significance, in relation to cellular defense against oxidative stress. Previously, aged garlic extract has been reported to prevent ADR-induced cardiotoxicity through its direct antioxidant effect . In this regard, mechanism of cardioprotection by garlic in the present study is novel. The most abundant reactive oxygen species (ROS) generated in living cells are superoxide anion and its derivatives, particularly highly reactive and damaging hydroxyl radical, which induces peroxidation of cell membrane lipid . Lipid peroxidation is known to induce cellular damage and is responsible for ROS induced organ damage . In this respect, any increase in SOD activity of the organ appears to be beneficial in the event of increased free radical generation. However, it has been reported that a rise in SOD activity, without a concomitant rise in the activity of catalase and/or GPx might be detrimental . It is due to the fact that SOD generates hydrogen peroxide as a metabolite, which is cytotoxic and has to be scavenged by catalase or GPx. Thus a simultaneous increase in catalase and/or GPx activity is essential for an overall beneficial effect of increase in SOD activity. Inhibition of adriamycin-induced oxidative stress and tissue injury might be attributed to the increase in both myocardial SOD and catalase activities, following chronic garlic administration. Increase in lipid peroxidation following acute adriamycin administration, was significantly prevented by both the doses of garlic and this effect was comparable with that of probucol treatment. The improvement in myocardial TBARS was much less with the higher dose than with the lower dose. This can be explained by the fact that basal TBARS value was higher after chronic garlic treatment in 500 mg/kg dose than 250 mg/kg dose . The paradoxical rise in the level of reduced glutathione in adriamycin-induced cardiotoxicity was blunted in garlic as well as probucol treated hearts. This supports our hypothesis (as mentioned before) of "trapping" of glutathione in its reduced form (GSH) in ADR treated rat heart, which was postulated to occur due to reduction in GPx activity. Rise in GSH level was absent in garlic and ADR-treated rat hearts due to prevention of reduction in myocardial GPx activity. Significant preservation of myocardial catalase and GPx activities was seen with 250 mg/kg dose of garlic, whereas significant preservation of myocardial SOD and GPx activities was seen in 500 mg/kg garlic treated group. Although myocardial protection was observed in garlic (250 and 500 mg/kg) and probucol treated groups, 500 mg/kg dose of garlic seems to be better as evident from the histopathological studies supporting the earlier statement of the significance of simultaneous increase in SOD and GPx activity in mitigating oxidative stress. Expression of various cytokines, especially that of TNF-α is enhanced in various pathophysiological states, associated with increased oxidative stress [14, 15], which in turn promotes the induction of various other cytotoxic substances on endothelial cells and myocytes. This has profound pathological significance, in terms of development of cardiomyopathy, myocyte apoptosis, transmural myocarditis and biventricular fibrosis as well as overall functional deterioration of heart [33, 34]. Adriamycin, in our study, caused marked TNF-α expression in the subendocardial region, myocardial cells and intramyocardial vessel wall. It is possible that increased oxidative stress following adriamycin administration caused expression of TNF-α. Oxidative stress is known to activate P38-mitogen activated protein (MAP) kinase and nuclear factor kappa B and thus play a role in the sequence of signaling events involved in myocardial TNF-α production [35, 36]. To the best of our knowledge, expression of TNF-α in heart of ADR-treated rat is reported for the first time in the present study. Probucol, as well as 250 mg/kg and 500 mg/kg of garlic treatment reduced the myocardial expression of TNF-α, following adriamycin administration which was associated with reduced myocyte injury, an effect which might be attributed to reduction in oxidative stress. It is concluded that garlic protects adriamycin-induced acute cardiotoxicity by preservation of endogenous antioxidant, reduction of lipid peroxidation and TNF-α expression in rat heart. The study reveals the role of nutritional factors in preventing adriamycin-induced cardiotoxicity. The study has been approved by the Animal Care Ethics Committee of Institute. Laboratory bred Wistar albino rats of both sexes weighing between 150 gm and 200 gm, maintained under standard laboratory conditions of 22 ± 2°C, relative humidity 50 ± 15% and photo period (12 hr dark/12 hr light) were used for the experiment. Commercial pellet diet and water were provided ad lib. Commercial pellet diet (Hindustan Lever, India) contains protein: 24%, fat:5%, fiber:4%, carbohydrate:55%, calcium:0.6%, phosphorous: 0.3%, moisture:10% and ash:9% w/w. Garlic was obtained from the local market. Adriamycin was obtained from Dabur India Ltd. and probucol from Sigma Chemicals Co., USA. All chemicals were of analytical grade and chemicals required for sensitive biochemical assays were obtained from Sigma Chemical Co., USA. Double distilled water was used in all biochemical assays. Garlic cloves were peeled, sliced, ground into a paste and then made a homogenate in distilled water. Two doses of garlic homogenate, 250 mg/kg (0.1 gm/ml) and 500 mg mg/kg (0.2 gm/ml) were fed daily to the rats within 30 minutes of its preparation for a continuous period of 30 days. A control group of rats were fed only with standard rat feed and double distilled water (the vehicle for the extracts) and was maintained for the same period. Rats were divided into five groups containing eight rat per group. In the control group (CTR), rats were fed with double distilled water. In the group ADR, adriamycin (30 mg/kg single dose) was administered intraperitoneally. Probucol (cumulative dose, 120 mg/kg body weight divided in 12 equal injection over a period of 30 days) was administered intraperitoneally followed by adriamycin (30 mg/kg single dose) challenge in group PRO+ADR. In case of groups G-250+ADR and G-500+ADR, adriamycin (30 mg/kg single dose) was administered intraperitoneally in the rats treated with 250 mg/kg and 500 mg/kg garlic homogenate, respectively, after completion of their 30 days treatment. After 24 hours of adriamycin administration the rats were heparinised (375 units/200 gms, i.p) , sacrificed half an hour later with anaesthetic ether and hearts, harvested for the following procedures. Heart was homogenized in 10% trichloroacetic acid in 4°C. A 0.2 ml homogenate was pipetted into a test tube, followed by the addition of 0.2 ml of 8.1% sodium dodecyl sulphate (SDS), 1.5 ml of 30% acetic acid (pH-3.5) and 1.5 ml of 0.8% TBA. Tubes were boiled for 60 min. at 95°C and then cooled on ice. 1.0 ml double distilled water and 5.0 ml of n-butanol:pyridine (15:1 v/v) mixture were added to the tubes and centrifuged at 4000 × g for 10 minutes. The absorbance of the developed colour in organic layer was measured at 532 nm. Commercially available 1,1,3,3-tetraethoxypropane (Sigma) was used as a standard for MDA. TBARS are expressed as nmol/gm wet wt. Heart was homogenized with 10% TCA and centrifuged at 3000 × g for 10 minutes. The reaction mixture contained 0.1 ml of supernatant, 2.0 ml of 0.3 M phosphate buffer (pH-8.4), 0.4 ml of double distilled water and 0.5 ml of DTNB [5,5 dithiobis (2-nitrobenzoic acid)]. The reaction mixture was incubated for 10 minutes and the absorbance was measured at 412 nm. The level of GSH was determined from the standard curve with commercially available GSH (Sigma chemical). GSH are expressed as μ mole per gm wet weight. Heart was homogenized at 4°C (1:10) in 50 mmole/l potassium phosphate buffer (pH-7.4) and centrifuged at 3000 × g for 10 minutes. Supernatant (50 μl) was added to a 3.0 ml cubette that contained 1.95 ml of 50 mM phosphate buffer (pH-7.0). 1.0 ml of 30 mM hydrogen peroxide was added to it and changes in absorbance were followed for 30 sec. at 240 nm at an interval of 15 sec. Catalase activity was expressed as units per mg protein. Hearts was homogenised in 0.25 M tris sucrose buffer and centifuged at 10,000 × g for 15 minutes at 4°C. The supernatant was fractionated by 50% ammonium sulphate and dialysed overnight. Aliquots of the supernatant (100 μl) was added to sodium pyrophosphate buffer (pH-8.3) followed by addition of 0.1 ml of 186 μM phenazine methosulphate, 0.3 ml of 300 mM nitroblue tetrazolium and 0.2 ml of 780 μM NADH. Reaction mixture was incubated for 90 second at 30°C and the reaction stopped by adding 1.0 ml of acetic acid. 4.0 ml of n-butanol was then added and centrifuged at 3000 × g for 10 minutes. The absorbance of organic layer was measured at 560 nm. SOD is expressed as units per mg protein. Heart was homogenized at 4°C in 0.25 M phosphate buffer saline (pH-7.0). Homogenate was centrifuged at 15,000 × g for 60 min. at 4°C and supernatant was assayed for the GPx activity. GPx activity was assayed in a 1.0 ml cubette containing 400 μl of 0.25 M potassium phosphate buffer (pH-7.0), 200 μl of sample, 100 μl of 10 mM GSH, 100 μl 2.5 mM NADPH and 100 μl of glutathione reductase (6 U/ml). The reaction was started by adding 100 μl of 12 mM hydrogen peroxide and changes of absorbance at 366 nm at 1 min interval for 5 min. were measured. GPx activity are expressed as units per mg protein. Protein concentration is measured by Bradford method. Hearts were fixed in 10% formalin, processed and embedded in paraffin. 3 μm. thick paraffin sections were cut on glass slides and stained with hematoxylin and eosin (H&E), periodic acid Schiff (PAS) reagent and examined by light microscope to assess gross myocyte injury (adriamycin-induced) and the effects of the interventions. In each group, rats were taken for the estimation of heart weight: body weight ratio . Body weight was the weight on the day of sacrifice. Heart weight was measured after keeping the heart in cold saline and squeezing out the blood. Rats were sacrificed and hearts perfused with 10% formalin and finally stored in 10% formalin at 4°C for paraffin sectioning (N = 3). Five-micron-thick paraffin-embedded sections were used for immuno-staining using an immuno-enzymatic staining kit (DACCA PAP kit, system 40; DAKO). After deparafinization and hydration through two changes of xylene and graded alcohol for 10 minutes in each solution, tissue sections were incubated in a humidified chamber with proteinase K (20 ug/ml; Sigma) for 15 minutes at 23°C and washed in distilled water. After washing in Tris-buffered saline (TBS; 0.05 mole/L Tris, pH 7.4, 0.15 mol/L NaCl), endogenous peroxidase activity was blocked by incubating for 5 minutes at 23°C in 3% H2O2 in TBS, washed in TBS (four times for 2 minutes each), and incubated for 40 minutes at 23°C with blocking solution (0.5% Tween 20 plus 0.5% BSA plus 10% normal goat serum, pre immune) to block nonspecific binding. The sections were then incubated at 23°C for 1 hour with rabbit anti-mouse TNF-α (2.0 ug/ml)(Santa Cruz Biotechnology, Inc.), washed in TBST (TBS plus 0.5% Tween 20) three times for 5 minutes each, incubated at 23°C for an additional 20 minutes with secondary antibody (goat anti-rabbit; DAKO). After washing in TBST 3 times for 5 minutes each, the sections were incubated for 20 minutes at 23°C with soluble horseradish peroxidase/rabbit anti-horseradish peroxidase complex prediluted in TBS. The sections were then incubated with 3,3'-diaminobezidine tetrahydrochloride (DAKO liquid DAB) as the substrate. Counter staining was then performed with Mayer's hematoxylin (Fluka, Rankonkoma. NY). After dehydration, cover slips were mounted on slides in Permount (Sigma). Omission of primary antibody and use of rabbit pre immune serum in place of primary antibody after neutralization with its peptide antigen (Santa Cruz Biotechnology) served as controls. Five independent observers blinded to the groups studied scored the sections and the average data presented a consensus value of all observations. All values are expressed as mean ± SEM. One way ANOVA was applied to test for significance of biochemical data of different groups and Student's t-test was applied to test for heart weight: body weight ratio. Significance was set at p < 0.05. The authors acknowledge the financial support as fellowship to SKB, from Council of Scientific and Industrial Research (CSIR), Government of India, New Delhi, India, (9/6 177/99-EMR-I) for this work. Author SM, SKB & MM carried out the animal experimentation, biochemical estimation, immunocytochemistry and statistical analysis of results. Author AKD carried out the light microscopic and immunocytochemistry study. Author KKT helped in designing and discussion of the results of the study. Author SKM conceived the study, and participated in its design, coordination and drafted the manuscript.